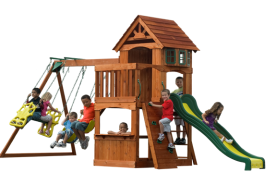 The Prestige Wooden Swing Set by Backyard Discovery is a wonderfully affordable swing set that is perfect for small backyards. It includes many of the great features of a larger swing set but in a smaller package. Kids will have a blast climbing the rock wall, swinging to the stars, and hanging out in the club house. 1 What makes the Prestige fun? 2 How much space do I need in my yard? 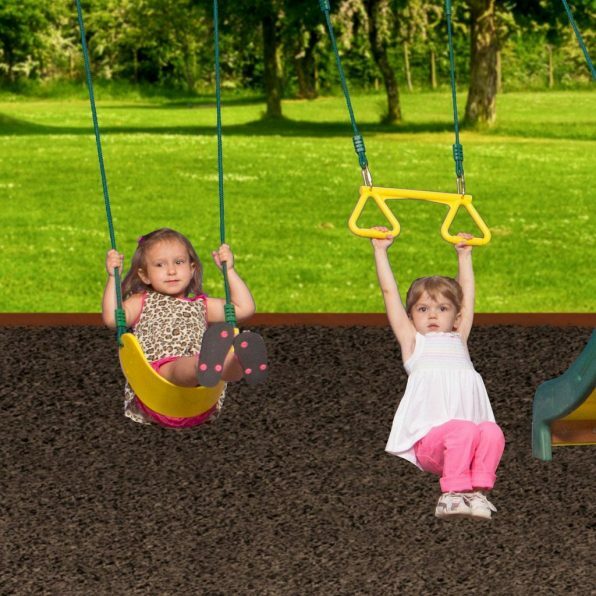 4 How do I take care of my swing set? What makes the Prestige fun? The most exciting part of the Prestige swing set is the attached snack bench and table. This is a great spot to hang out with a snack, read a book, or chat with a friend. It is also a great feature for dramatic play. Kids can play restaurant, house, or school. The possibilities are endless. The great thing about the bench is that is built into the swing set and will never get lost, misplaced, or tripped over. The bench and table are attached to the underside of the upper deck and clubhouse. The underside of the clubhouse can pull double-duty and be used as a sand box holding up to 3 cubic feet of sand. This is the best spot for a sandbox as it is out of the way. And with the deck being 4 feet off the ground there is plenty of room for kids to stand up. This is essential when one needs to bury one’s feet. The upper deck is a safe four feet off the ground and is accessible by wooden ladder. The ladder can also be used as a rock wall for an extra challenge. The upper deck measures 30 inches square which is a great size for a little club house. 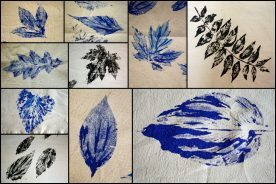 This is another wonderful opportunity for dramatic play. It becomes a house, club headquarters, or a super hero’s secret lair. The clubhouse is topped with a colorful, fabric canopy. Kids can exit the clubhouse by sliding down the 8 foot Speedy Slide. Attached to the clubhouse is the swing beam from which two swings and a trapeze bar hang. Never underestimate the swings. Kids will come back to them again and again, swinging for hours. The Prestige wooden swing set is recommended for kids aged 3-10. There is a recommended limit of 7 kids weighing no more than 120 pounds. Invite the neighbor kids over and have a blast! 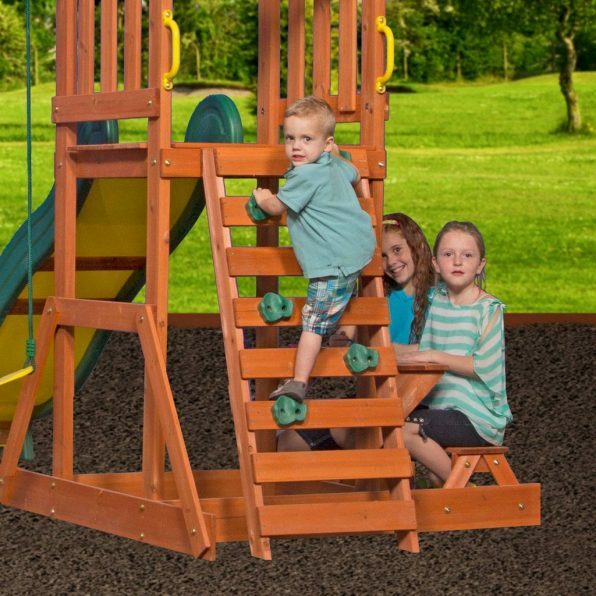 There are many safety features used by Backyard Discovery in the creation of their swing sets. The first is the use of Safe-T-Fuse Hardware. Safe-T-Fuse locking nuts are able to resist loosening as time goes on and they have rounded surfaces which won’t cause scraps or catch clothing. All Backyard Discovery swing sets are ASTM compliant. This means they meet or exceed the regulated safety standards to ensure your kids, family, and friends will stay safe while playing. Heavy-duty brackets are used to join as the major components of the swing set. These brackets are made from high-strength steel and are powder coated. All metal parts of the swing set are powder-coated which provides protection from the elements. All wood used in the swing set is 100 % cedar wood. This is an excellent wood to use outdoors as it is naturally rot, decay, and insect resistant. The cedar wood is naturally chemical-free and is top-coated with a water-based stain for appearances. The wood comes conveniently pre-cut and pre-drilled to make assembly a breeze. All plastic parts of the swing set are UV resistant which means they will resist damage from the sun. How much space do I need in my yard? Before purchasing your chosen swing set it is important to know how it will fit into your yard. 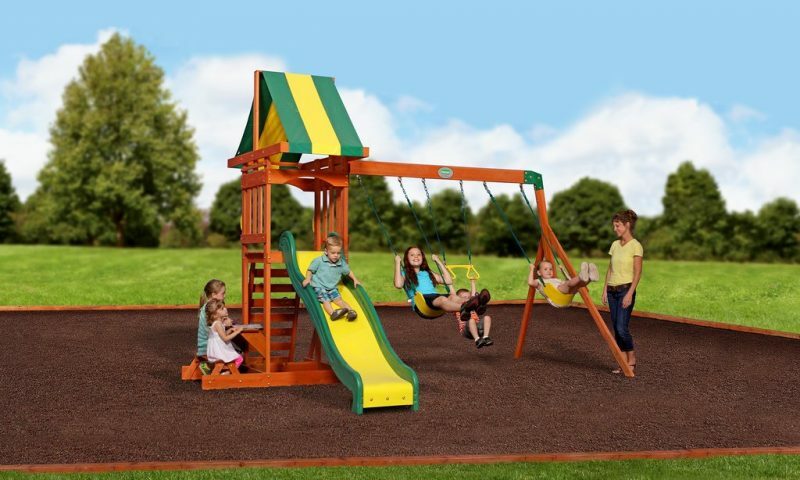 The Prestige swing set measures 13 feet and 4 inches in length, 10 feet and 9 inches in width and is 9 feet and four inches tall at the highest point, which is the canopy. This is a good size for a smaller backyard. 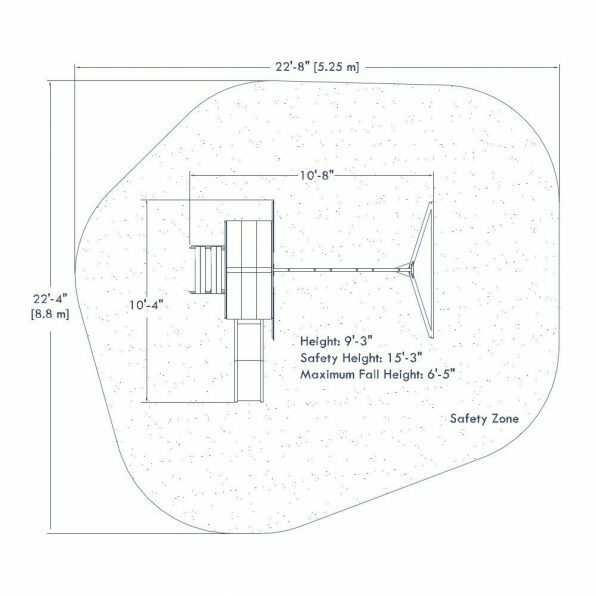 When planning on where to set up the swing set you’ll also need to consider the recommended 6 foot safety zone. This means the swing set should be placed no closer than six feet in all direction from all structures and obstacles such as your house, garage, barn, shed, porch, trees, clotheslines, or powerlines. After assembly you’ll need to consider what to use to surface the play area. It is not recommended the swing set be set up on packed earth, concrete or any other hard surface. Instead you’ll want to add loose surfacing to reduce the chances of injuries caused by a fall. Examples of surfacing materials that are good shock absorbers include: mulch, shredded tires, wood chips, or fine gravel. You can read more about surfacing options here. The box the swing set comes in measures 91 inches long, by 27 inches wide, and 8 inches tall. It weighs 165 pounds. This is important if you plan on purchasing your swing set at a retailer and transporting it home yourself. All Backyard Discovery swing sets come with an instruction manual. Included in the manual you will find frequently asked questions, warranty and maintenance information. The easy-to-follow, step-by-step instructions are fully illustrated with all the parts labeled to speed installation. You can check out the manual here. Two adults should be able to assemble the swing set in about 6-8 hours. You’ll need a few tools to help you such as a drill, level, hammer, and tape measure. It is a good idea to take an inventory of all the parts before you begin construction. If you find any parts are damaged or missing you can contact customer service for a replacement. How do I take care of my swing set? To increase the life of your swing set there are a few recommended activities that will help keep your set in good shape. The most important thing you’ll want to do is to apply a stain or sealer to your wood at least once a year. This will protect the wood and decrease the chances of rot and decay. Before you stain you’ll want to sand down any splinters you may find. Depending on where you live you many need to stain the swing set wood more than once a year. When the weather begins to get colder and drops below freezing it is a good idea to remove the swings, trapeze bar, and canopy. Store these items inside or in the garage. Keeping them out of the elements will increase their life span. You can replace these items in the spring when it begins to warm up. In the spring when you replace the swings you should also check and tighten all the hardware. The moving metallic parts, such as the swings, should be lubricated. Check the protective covers of bolts, edges, pipes, and corners and tighten if any are loose. If you find any rust you should sand this off and re-paint. During the play season be sure to check and tighten the hardware twice a month. Lubricate the moving parts and check them for deterioration during the bi-monthly checks. Finally, it is a good idea to check the depth of the surfacing material at the beginning and end of the play season as well as monthly while the swing set is being used. Check that the material hasn’t become compacted or thin in areas. Add more if needed to reach the desired depth. All swing sets made by Backyard Discovery come with a warranty. The warranty covers all the parts against defects for one year. The wood is covered for rot or decay for up to five years. It is requirement of your warranty that you re-stain the wood annually. 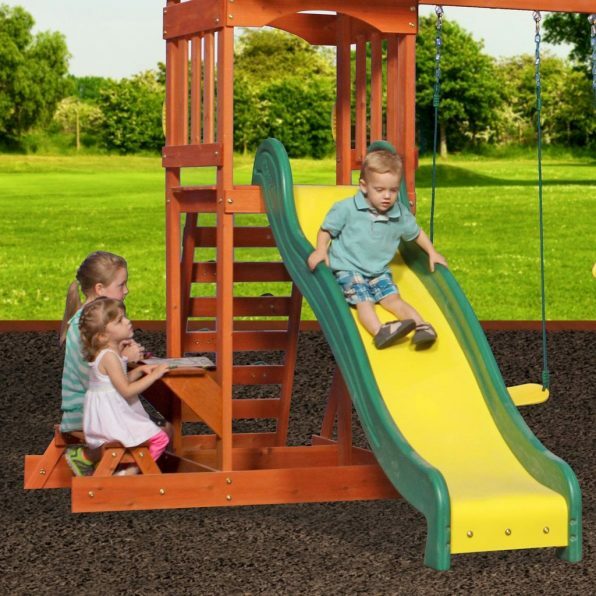 The Prestige Wooden Swing Set is wonderful for families with small yards. 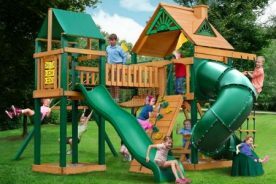 It can accommodate a good number of kids and will keep them moving, playing, and imagining for hours. With a price you can’t beat it will look great in your back yard.